We are so proud to have New Mexico Magazine do another artist profile on us. The first profile was a few years ago on some bowls we made. 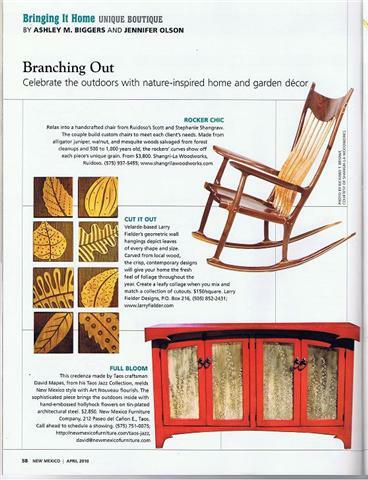 However, the profile for their most recent April 2010 issue (available now) will showcase our Black Walnut with Curly Cherry Rocking chair. This rocker featured our contrasting wood joints (as seen above), where the seat and the legs meet. The black walnut came from an old growth tree (approximately 600 years old) along the Hondo River outside of Ruidoso NM and had the most incredible figure we have ever seen in walnut. The walnut had very dark, almost black burling along with blond sap wood. The contrast between the walnut and the curly cherry was very striking. The curly cherry which has beautiful tiger figuring was used on the back spindles, inlayed into the runners and wrapped around the joints. We are very excited about this profile in New Mexico Magazine, since it is a highly saught after magazine across the US. The calls are already coming in on this profile. The woodworker and his wife that we made the rocker for were so excited and surprised to see their rocker in the magazine, that they called us right away. Or see it featured here on our blog, under the pages sections. We just finished up a rocking chair class with a gentleman that flew in from Virginia, to make a rocker for his first grandchild. 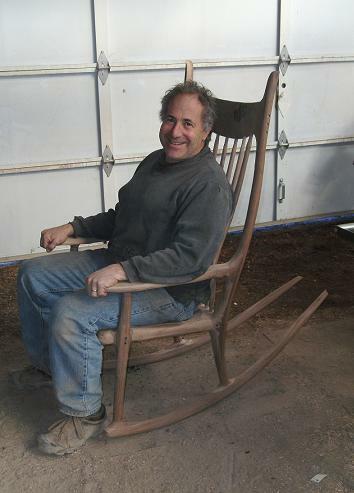 This class is based on a Sam Maloof style rocking chair with our own design elements implemented. I am posting some of the photos from that class, along with some brief descriptions of what is going on. As soon as Dr. Peck finishes his rocker up, I will post pictures of it. The 6 day class went real good. It was a pretty muddy mess up here and we got some snow, but otherwise the weather was ok. Dr. Peck stayed at a cabin nearby and just loved it. He went hiking in the mornings before the class and at night sat out and stargazed (we have some magnificent night skies up here). Dr. Peck has made some furniture pieces for he and his family, but did comment on how much more involved making a rocker was. Since he had to fly back home and wanted to avoid shipping a fully assembled rocker, it was roughly put together and then dissasembled for packing. We decided to offer this with all our classes, to make it easier and cheaper for someone to get their piece back home. There is a little more work involved after getting home, but this also keeps things fresh in their minds so they can complete their rocker. We all had a lot of fun, learned a lot and I do believe Dr. Peck was quite tired at the end. 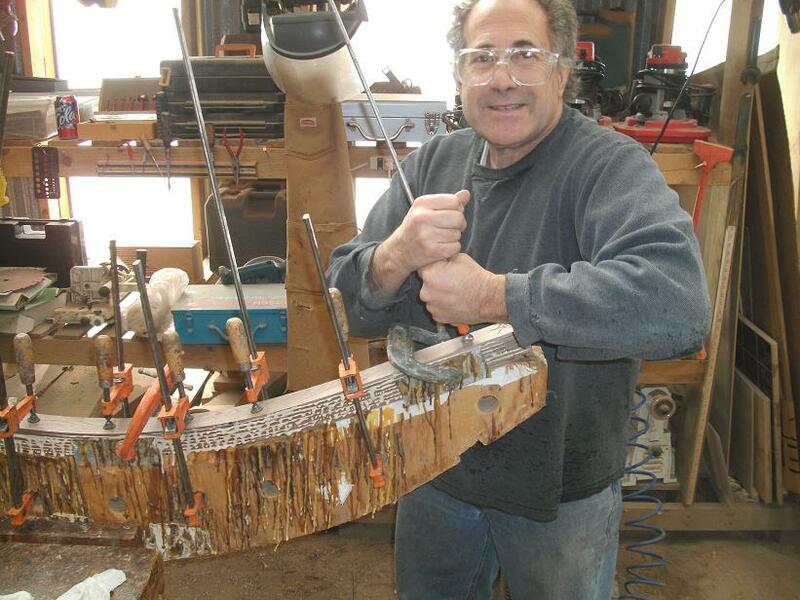 This picture shows a runner being glued up in the bending form. There are a lot of clamps that have to be used for this. Tom is really putting some muscle into tightening the clamp. Here Tom is grinding the joint area, where the seat and legs meet. When he gets home and starts putting the rocker back together, he will finish up the shaping of these areas. 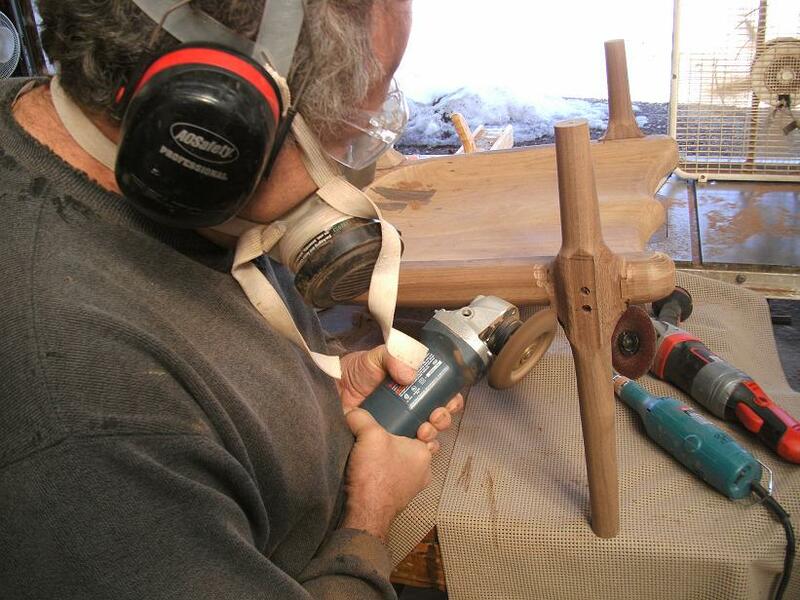 This photo shows how the rocker is coming together. The arms and joint areas are done, except what final work Tom will need to do at home. The spindles and headrest are also being testfit here. Tom finally gets to try out his rocker. I do believe after 6 long intense days, that he’s a little tired here. But well worth it. After this photo, the rocker was disassembled and packed away for the flight back to Virginia. Amazing that the rocker fit in three bags. We had a great time that week with Tom and look forward to getting photos of it completed and with the new mom and grandbaby rocking in it. For more photos on our rocking chairs please visit our website. 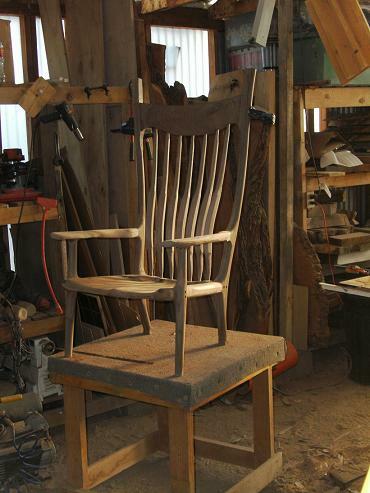 This office chair was made from “Forest Reclaimed” Juniper. It goes with the “Running Wild” Horse Desk. 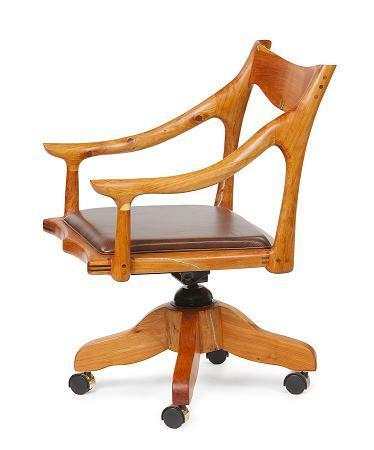 The main features of this desk chair are the handshaped arms and backrest. All the handshaping of the arms makes them very comfortable and smooth to the touch. The carved Dog Ears on the backrest are a favorite feature to run your fingers over. Walnut plugs and seat splines were used to add a darker contrast to the chair. That along with a Leather upholstered seat and turquoise inlay, help the chair blend in with the dark of the desk. A handshaped base was added to disquise the metal frame of the wheel base. The base adjusts up and down, tilts and swivels. This is our first office chair in our low back style. “Grand Canyon” was carved from an approximately 800 year old Juniper tree. Most of the wood we use on the vessels comes from “Forest Reclaimed” wood or property cleanup to help prevent forest fires and increase the water shed. The diameter of this piece is approximately 36″ tall and long and the width at the opening is about 16″. It was first carved with the chainsaw to remove most of the material and start the shape. Then grinders were used to do the final shaping and create the folds and bends. Turquoise was added to a majority of the natural cracks and holes, but we decided to leave a few openings to allow the eye to look through to the other side. 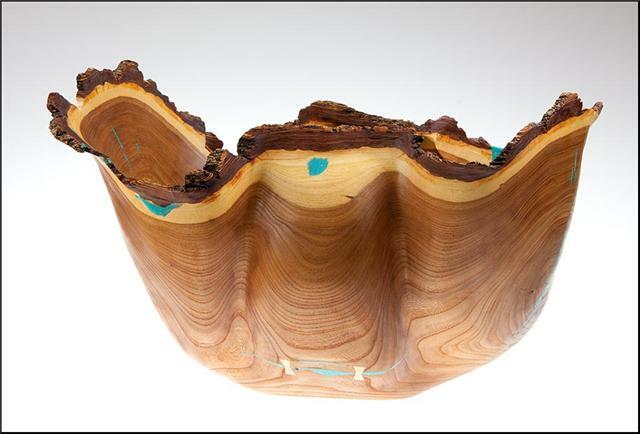 “Elm Canyon” was carved from an Elm tree that was dead standing at our photographers studio. The wood was very hard and dense with beautiful grain patterns. The sap wood and the outer bark were left on for a beautiful contrast between colors. Turquoise was inlayed into the natural cracks and two bowtie were inlayed over a larger crack (as shown in photo). 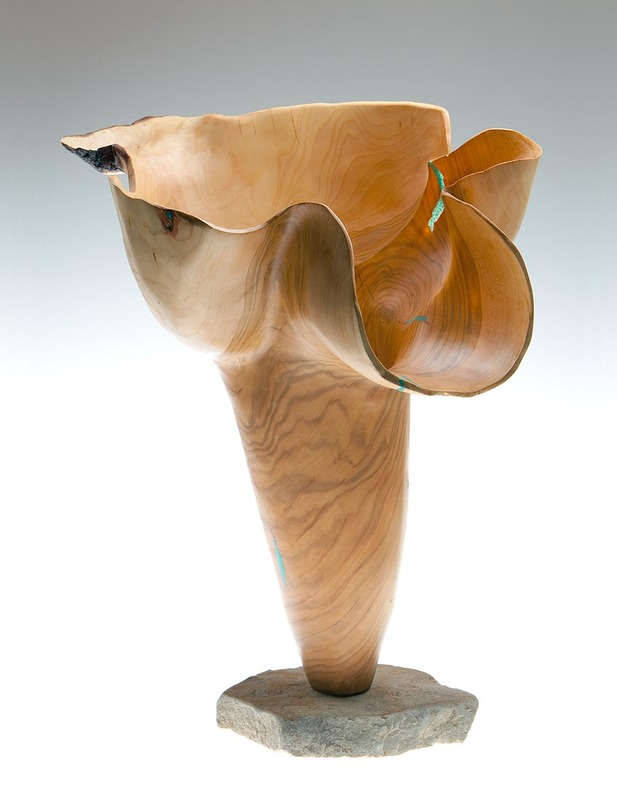 This piece was approximately 26″ long, 18″ tall and 10″ wide. “Margarita Ville” is a Choke Cherry vessel that sits ontop of a piece of flagstone. The chainsaw was used to carved the cone shape and start the shaping of the top. Grinders did the final shaping, creating the folds and bends. 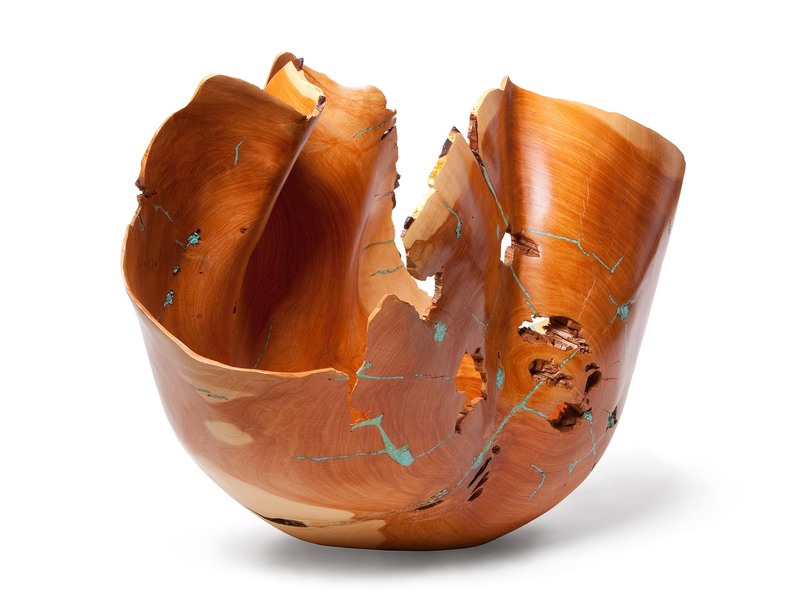 Turquoise was inlayed into some of the few natural cracks that were on the piece. This piece stands approximately “32” tall and has a diameter of 14″ with the lip that comes out. You are currently browsing the Shangrilawoodworks's Blog blog archives for March, 2010.